If you have been to a potluck chances are you have tried a pineapple and bacon wrap. 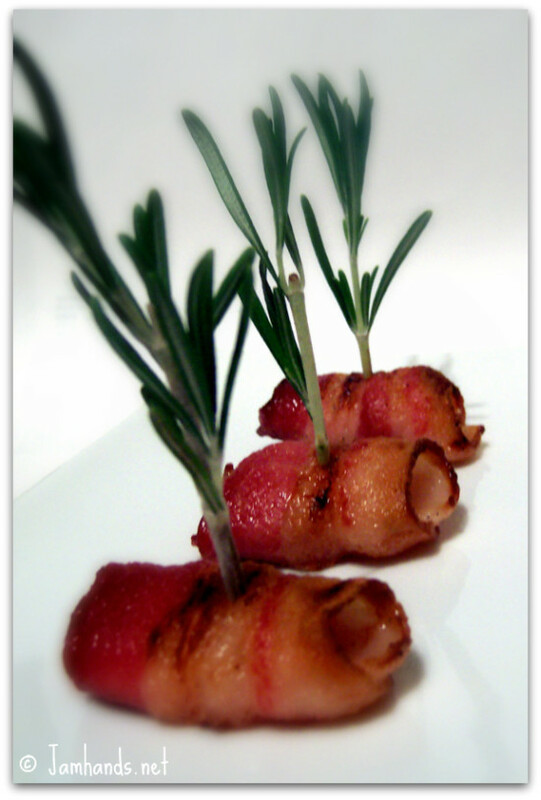 What makes these different is the addition of vanilla bean seeds added to the pineapple, as well as a rosemary skewer. The skewer is optional. I couldn't quite decide if I liked them aesthetically or not. I will note that they taste significantly better when they aren't piping hot. The heat brings out the heavy vanilla scent and leaves a strong after taste. If you let them cool down just a tad the after too-strong taste pretty much disappears. 1. 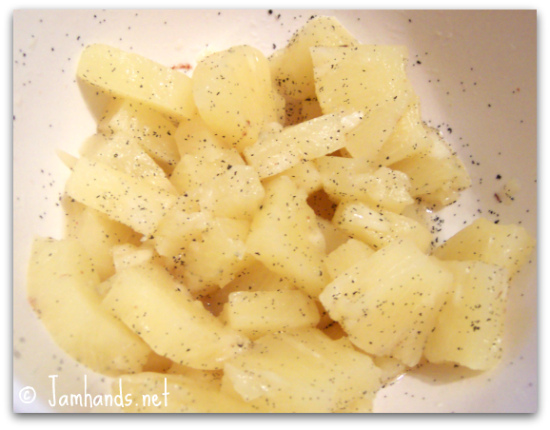 Cut up pineapple into goodly sized chunks and mix with vanilla bean seeds until the seeds are evenly distributed. 2. Cut bacon slices in half, then wrap around a chunk of pineapple. Place with bacon tail ends down on a baking sheet. 3. Broil in oven for about 10 minutes, watching carefully so bacon doesn't burn. After cooling them for a bit, take a very small-width-ed (is that a word? I have no idea) knife and pierce through so Rosemary can easily sit inside. Serve and enjoy! These really look delicious as so so many of your appetizer recipes!!! My sisters and I just started our first themed blog hop over at http://everydaysisters.blogspot.com beginning tomorrow. This weeks theme is appetizers. We would love for you to come over and share these or any of your favorite appetizer recipes with our blog readers. Have a great weekend.